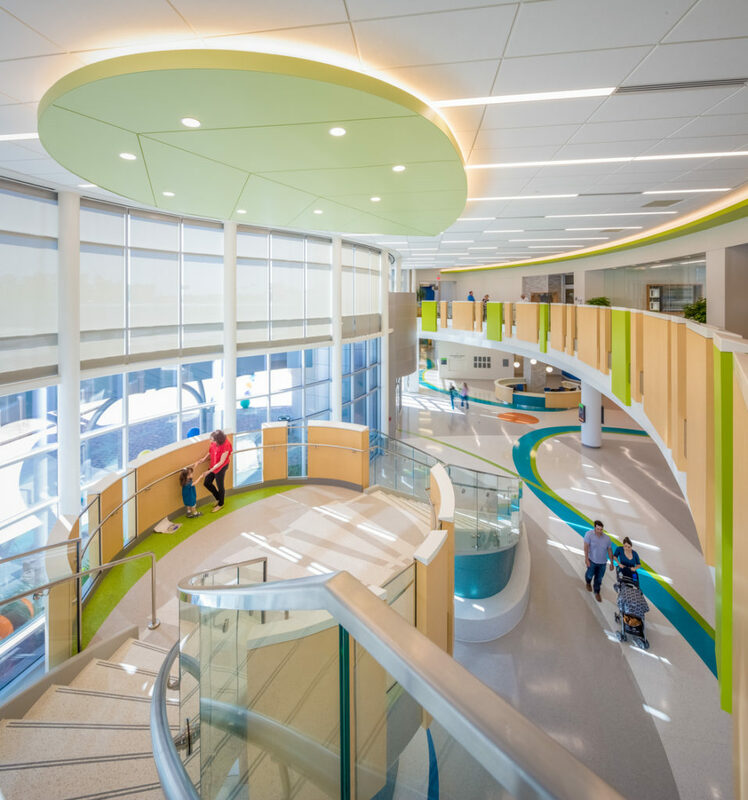 HOUSTON, TX, November 3, 2017 – The International Interior Design Association (IIDA) selected Texas Children’s Hospital The Woodlands as one of the winners of its 2017 Healthcare Interior Design Competition. The program honors outstanding originality and excellence in the design and furnishings of health care interior spaces. 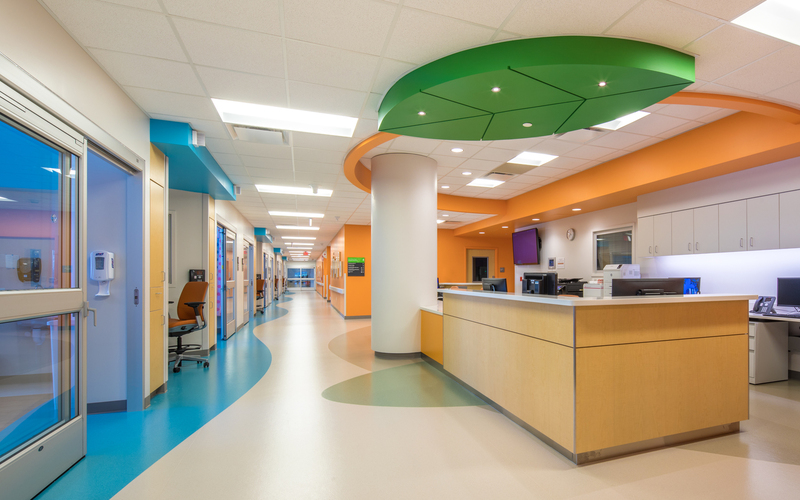 FKP designed the new full-service hospital, one of two winning entries in the Pediatric Hospital category. Most visitors park in a remote garage and pass through the adjacent outpatient building to enter the hospital. To ease way-finding, FKP envisioned a winding blue stream in the terrazzo floor pattern to connect each building entrance to the welcome desk in the two-story lobby. An abstracted leaf in the ceiling above the desk indicates the specific location where visitors can get assistance. Young children intuitively understand the indirect stream is an invitation to explore. Their first stop is the lobby grand stair, which is conceived as a tree house growing out of the terrazzo plinth, which also serves as a continuous bench. There’s a fort at mid-landing and a secret hideout within its glass-tiled cylindrical base. The stair connects visitors to the Chapel and Gift Shop on the second floor balcony. The Woodlands’ population grew by almost 94 percent between 2000 and 2014, and in 2017 data site Niche ranked The Woodlands as the sixth best U.S. city to live in. To help meet the growing needs of this community, Texas Children’s Hospital The Woodlands opened in April 2017. It is Texas Children’s second community hospital, and the first devoted to children’s care for communities north of Houston. The five-story, 60-bed pediatric hospital is linked directly to a six-story outpatient building, which opened in October 2016 and includes 72 exam rooms and clinics for major pediatric specialties. The hospital’s inpatient building features the area’s only dedicated pediatric emergency center with 25 exam rooms, 32 acute care beds, 28 critical care beds, four operating rooms and 12 radiology suites. The stream also leads visitors to the bright and welcoming dining room that features glass tile accents and a wood plank ceiling in a symbolic sun. Floor-to-ceiling glass looks onto the landscaped courtyard and a wildflower meadow. 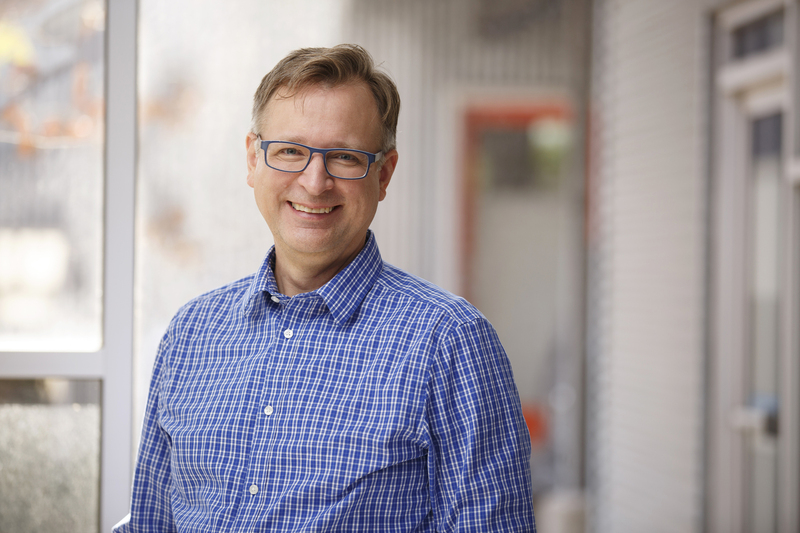 Steve Kopp, Vice President and Senior Designer at FKP, led the design team for the new Texas Children’s Hospital The Woodlands. The playful interior design not only creates a welcoming environment, it also supports the institution’s brand. FKP began supporting Texas Children’s in 1994, developing the system’s first campus master plan. The long-term working relationship has allowed the firm to become immersed in Texas Children’s vision and operations, resulting in more patient-centric facilities. Nurse stations in clinical areas share many of the same way-finding elements, including the green leaf above each welcome point. Patient rooms feature wood-look floors, and family-centered care is supported with all-private rooms and sofa beds for parents to room in. 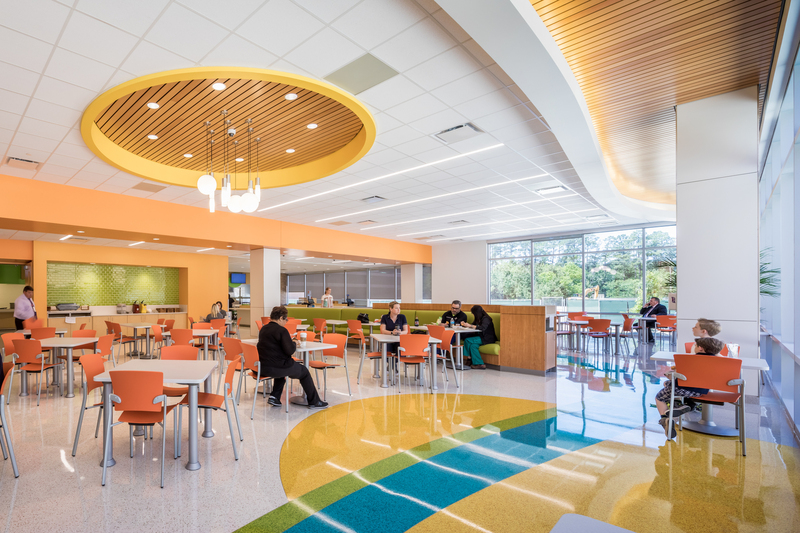 Also taking home an award in the Community Hospital category was CannonDesign, the New York-based firm with whom FKP recently announced a pending merger. IIDA recognized CannonDesign for its design of UC San Diego Health’s Jacobs Medical Center in La Jolla, California. The organically-formed, 10-story hospital functions as three hospitals in one – housing inpatient services for high-risk obstetrics and neonatal care, cancer care and advanced surgical care.